Celebrating its 70th anniversary this year, and probably something like a thousand Le Mans entries, Porsche is out to prove that Germans can occasionally be nostalgic about something. While practically every car on the grid for the last decade has been some combination of red, white, and black, Porsche has painted up two of its four GTE Pro class 911 RSR entries in vintage liveries reminiscent of cars Porsche have run at Le Mans before in the 70s and 80s. Forget running the race, Porsche wins. The equivalent of a throwback jersey in stick and ball sports, the style-icon “Pink Pig” livery and victory-icon Rothmans livery give fans another facet about which to cheer during the race. 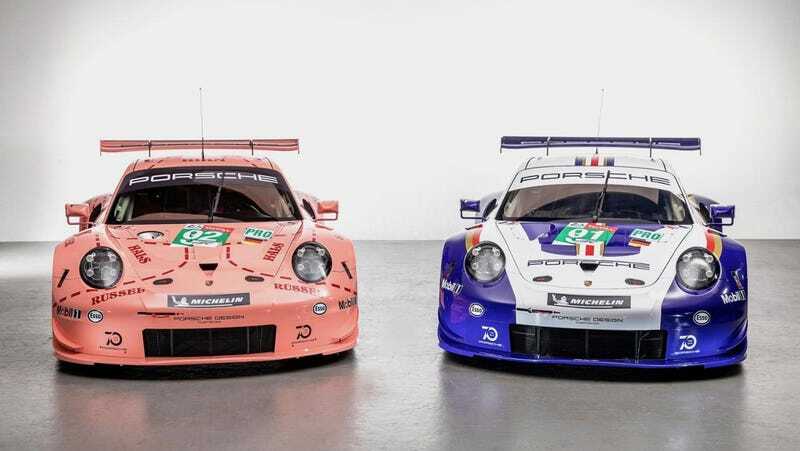 While I would prefer Porsche had gone wild enough with its standard livery to produce a truly iconic look to be admired for generations to come, this is far better than four visually identical racers running in the same class. Variety is the spice of life, after all. The #92 car, with Kévin Estre, Michael Christensen, and Laurens Vanthoor doing the driving duties, has been painted up in the famed “Pink Pig” look of Porsche’s 1970 Le Mans entered 917/20. The trio of Porsche factory drivers have raced at Le Mans before, but have suffered the bad luck of a DNF or non-podium finish each time. This little statistic makes them perfect for the Pink Pig car, as it suffered an ignominious fate at Le Mans as well. The story of the Pig’s livery is an interesting one. Following the team’s success at Le Mans in 1970, Porsche wanted to follow that up with another win, entering a scad of 917s. One of which had been given an unorthodox body, wider and curvier than Porsche’s usually sleek 917s, by French aerodynamic research company SERA to reduce drag at the high speeds Le Mans demands. The car was supposed to be entered under the Martini Racing banner, and arrived to the test day with a traditionally Porsche plain white livery. Allegedly, when Count Rossi saw the car he demanded that Porsche remove it from any association with the vermouth brand, as it looked fat, lumpy, and ugly. The mechanics on the Porsche team had already taken to calling the car “Der Truffeljäger von Zuffenhausen”, and as truffle hunters are French pigs, the idea to paint it up like a pig butcher chart was born. The 917/20 was driven in the 1971 Le Mans race by Reinhold Joest and Willi Kauhsen. After about 12 hours of racing, Joest crashed the car into the barriers and it was retired from competition. The factory boss was irate with Joest, even though he claimed no fault in the incident. The car, in his telling of the story, yanked to one side under braking and he was little more than a passenger as it collided with the k-rail. The broken car was cast off for many years before it was restored by the factory for display in the museum. Because the car was so much faster in a straight line than any other 917, the car was much harder on its brakes than any of the other cars. During the restoration, it was discovered that one of the front calipers had worn the pad material down to nothing and had essentially welded the backing plate to the rotor. Let’s hope nothing like that happens to the #92 911 RSR this year. Maybe that trio of drivers has enough in them to finally bring this pig to victory lane.